I’m not sure where last year went. It seems like only yesterday that we were loading the wagon for Chelsea! 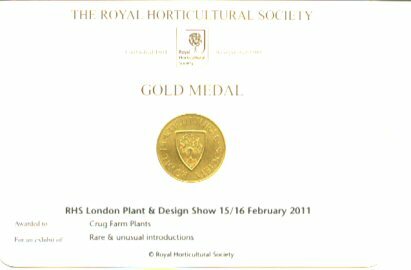 We were thrilled to be awarded another Gold Medal at Chelsea Flower Show this year. We had a lot of fun putting our display together, our Gunnera killipiana had a big impact. 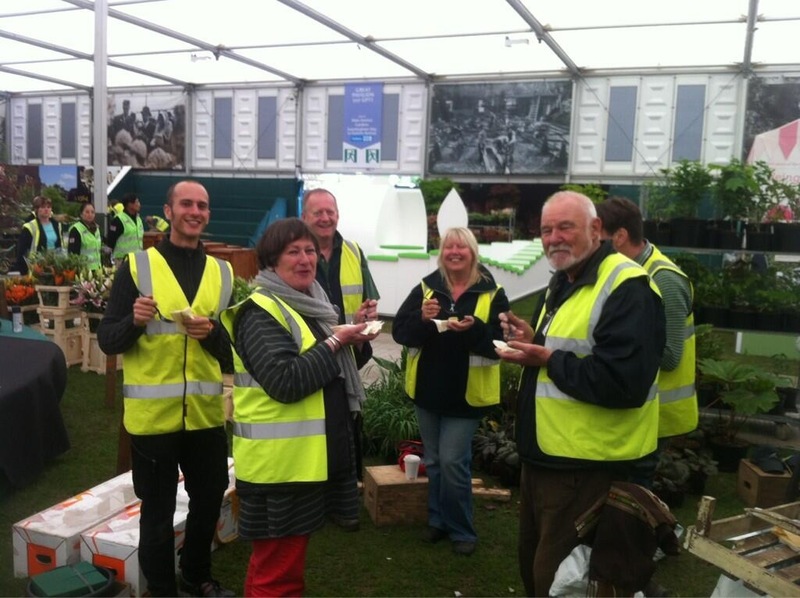 We enjoyed seeing many old, and making new, friends at Chelsea Flower Show. Are we doing it again? We shall see! No sooner were we back from the RHS Chelsea Flower Show than we were off again. The team, some friends and I celebrating my birthday at Chelsea. Our journey this time was over to the states to spend time with our dear friend Dan Hinkley. Who has finally tied the knot with his long time (30 years) partner Robert. We were very privileged to be invited to the ceremony. They also celebrated this by throwing a lavish party the following weekend “ 30/60” Thirty years together and Dan’s 60th. Where we met up with so many dear friends and meeting lots of new people from the gardening world. It was wonderful to meet up again with Jamaica Kincaid. We trekked together in Nepal in 2002. Whilst there we took advantage of being close to Vancouver and visited UBC Botanic Garden. We were shown around by Andy Hill and saw many of our collections growing there, including our Schefflera aff. alpina. We also visited Portland where Bleddyn gave a talk to The Hardy Plant Society of Oregon. Imagine my surprise when a lady whose family came from Wales approached me after the talk, she had met up with a distant relation whilst visiting Caernarfon some years ago. The distant relation only turned out to be my uncle. How small a world is that? Home for a week then it was off to the South of France (Menton) to see how our babies have settled in at Serre de la Madone. We also visited other gardens in the area in a whistlestop tour which we must thank Maggie Lockett for arranging as well as our stay at her beautiful home and garden before heading off to Lucca for Murabilia. This was our fifth year at the show and we were lucky to have an Italian speaking member of staff join us there for a few days, it certainly made things easier. The Italians loved our Tricyrtis formosana ‘Spotted toad’. Rosie Atkins and Stephen Lacey came out to judge the show, needless to say a good time was had by all of us tasting all sorts of lovely food and of course the wines. Home for seven days in order to host an RHS event here and close the sales area. Then it was off to Sikkim for five weeks collecting. (Bleddyn will be putting an in-depth account of the trip on line soon) So all in all last year was rather hectic but very enjoyable. Lets see what this year brings? We did it again!!!! Only our second time at Chelsea and we won a Gold. An intriguing glimpse into the mysterious world of modern-day plant hunting will be offered by Crûg Farm Plants at this year’s RHS Chelsea Flower Show, with an exhibit of rare and exotic specimens being shown in public for the first time. Unusually most of the plants, collected by Welsh nursery owners Sue and Bleddyn Wynn-Jones on expeditions to Vietnam, Taiwan, Korea and Japan, have been trialled for hardiness and can be grown outdoors in the UK, so are ideal for ordinary gardeners wanting something unique in their borders. Propagated from seed collected in remote parts of the world, the specimens being showcased will include the perfumed, evergreen larger flowered climber Holboellia brachyandra, grand architectural Scheffleras, forest floor-covering Saxifraga stolonifera ‘Kinki Purple’ (collected from the Kinki District of Japan) and the unusually bold Ophiopogon caulescens from northern Vietnam. The exhibit will feature a fisherman dressed in a traditional outfit made from the palm Trachycarpus, looking as though he has just met Sue and Bleddyn in the field, sitting next to a still pool of water and sifting through their horticultural finds of the day. His verdant forest backdrop will be filled with Disporums (fairy bells), Mainanthemums (false Solomon’s seals) and Polygonatums (Solomon’s seals). This is only the second time Crûg Farm Plants has exhibited at RHS Chelsea. In 2011, the nursery won a gold and the prestigious President’s Award. “We were so overwhelmed and humbled by people’s reactions to our plants the last time we were at Chelsea, we can’t wait to exhibit again, and in the show’s centenary year,” added Sue. Rhodoleia championii BSWJ11603 & WWJ11858 - it is sad to think that not long after we collected the seed of this gorgeous small evergreen tree the bulldozers buried it, making way for a new road. 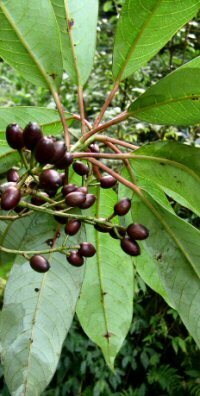 Here it had formed a classic shaped tree only 5-6m tall, well branched above the vertical trunk, with ovate to broadly ovate thick parchment textured leaves to 16 × 10cm, dark green glossy above whitish silver below. Piper heydei BSWJ10445 - our first offering of this primitive genus which we collected in the steamy forests of Guatemala in 2001, on our second expedition there. 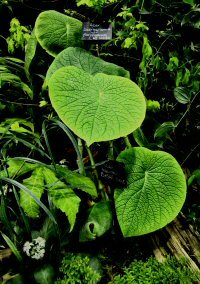 It was so dramatic that we just had to try it, for its sensational large orbicular rugose peltate foliage, on metre tall bristly knobbly stems of what appears to be an evergreen sub-shrub. Bearing long palest green to white flexuous pendant catkin-like branched inflorescences, from May ripening by autumn early winter. Hardiness not tested, yet, but has grown well in a frost-free polytunnel, that is kept shaded all year. Aesculus wangii - this has conkers the size of cricket balls. We brought the collection home from Vietnam and ended up paying $860 US excess baggage for these conkers!. Daphniphyllum cf. 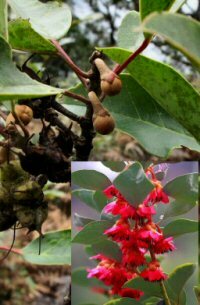 himalense KWJ12313 & KWJ12244 - a puzzling species collected in the forests on Fansipan, the highest mountain in northern Vietnam in 2007, where it formed a small tree 7-8m tall, well branched with a broad outline, young branches red. 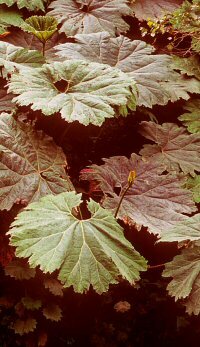 Clothed in large oblong-elliptic acuminate thick textured leaves 20-25 x 6.5-9cm, dark green above with prominent veins impressed, glaucous white below. Gunnera killipiana - originating from one of our collections on our first expedition to Guatemala in 2001, where this architectural species is fairly common between 2000-2500m particularly in moist shaded area. Where the plants form colonies, of this small trunked individuals with large palmate leaves with red spiny venation to 2m across held on deep red spiny stems to 2m long. Crûg Farm Plants is based on the edge of Snowdonia near Caernarfon in North Wales. Covering almost 20 acres, the nursery specialises in unusual herbaceous perennials, climbers, trees and shrubs, and hundreds of the plants on offer are propagated from over 15,000 seed collections gathered on well over 50 expeditions by Sue and Bleddyn. These range from Anemone to Zelkova and everything in between. As only a small number of people in the UK do this, their collections are much sought after around the world and the nursery has become a Mecca for keen gardeners. The primary goal of their collecting work is conservation and so they provide plants to a range of institutes involved in ex-situ conservation as well as award-winning show gardens, Royal and Botanic Gardens and National Trust collections. One thing about the early spring is that we are able to appreciate the reawakening of the gardens. Below are listed some of the plants that have caught our eye. Please check out our plant list for similar plants for more ideas on filling your woodland garden with colour at this time of the year. The plants listed below will all be flowering magnificently in our garden by early spring - such a joy! The RHS Spring Flower Show at Vincent Square kick starts our season earlier than we used to get going in the past. It does have the attraction of not having to prepare the entire nursery for its annual opening, with all the work that entails. But there is still plenty of preparation to do none the less, starting with compiling lists of plants that look good enough (difficult to show them at their best in February) to show what we are about. As well as seasonal favourites for sale to cover some of our expenditure. The Friday before is when the real work begins, the lists are scoured and the plants are pulled out, labelled and crated ready for loading onto a hired van (a Luton box van just about accommodates). Danish trolleys are collected from our accommodating neighbouring Seiont Nurseries, who kindly lend us the trolleys whenever we require them. Meanwhile the display plants are selected from the lists and prepared for packing into the van, these are becoming limited by their size as to which will actually fit into the van, which is why larger vehicles have to be used for The Chelsea Flower Show. On Saturday we collect the van and start packing the plants onto the trolleys, by this time they are ready sorted into the various heights to make the most efficient use of the adjustable shelving on the trolleys. We naturally double check that everything is labelled as it is carefully packed, then when we are satisfied that we have utilised the trolley space efficiently they are all wrapped in a protective film for transporting. At this stage we start loading the van, which is an art in its own right. We have to make use of every last nook and cranny to get all the gubbins that accompanies a show, else we have to leave it behind. There are all the accompanying props for the display, yards and yards of material, a hundredweight of newspaper, hundreds of empty container pots, fresh moss, composted bark, labels and not least a few mossy logs. Space has to be found for all, we just managed to squeeze our suitcase into the back. Come first light on Sunday we set off for the Big Smoke, luckily this year it only took us five hours to get there, we were lucky with the traffic. On our arrival we were greeted by Edward (Elfes) who had travelled down from Harrogate to help us. Edward is a very talented and widely acknowledged trained flower arranger, originally trained by Constance Spry no less, in time to assist her with the Queen’s Coronation flower displays. We were also met by young Daniel Bristow who now lives and works in London as a garden designer/landscaper, Sue’s press-ganged young muscle. He is a delight to work with and comes highly recommended if you garden in the London area and require some work doing, he’s your man. After the careful (it is careful after I’ve barked a few ‘’careful!’’ remarks) unloading and unpacking, the real work begins, setting up the display. I find that blank canvas daunting, at which point I make my most useful contribution of the show. By buggering off out of the way, leaving Sue and her helpers to set-up the bones of the display. 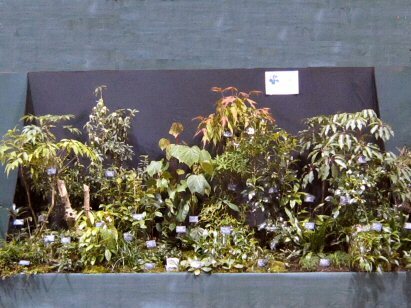 After a couple of hours a structure of the display starts to emerge, at which point I do dare, all be it at a suitable distance, pass comment that some of the plants I particularly want to draw attention to are not included. Sometimes I do get away with it, other times the distance I have allowed between myself and the display becomes useful in dodging the missiles. But all too soon we are running into the next day. On a good day I am even permitted to do some menial job like crunching up the newspaper for in-fill between the empty pots (in-fills between the display plants all hidden underneath a layer of fabric overlaid with a layer of natural material). Everything is fine tuned before this last job is started, to ensure that the best aspect of the display plants are facing the correct way and any damaged foliage is discarded or trimmed. Slowly but surely the display takes shape, the smaller foreground plants are installed while the finishing touch of a covering of moss or bark are added to hide any material. This is where the RHS are strict with their judging, they expect perfection and punish the slightest unnatural looking elements ruthlessly, something Sue and I discovered to our cost the hard way when we started displaying (now maybe you can see why I make my exit). Near completion everything is watered or sprayed for the final time and it is only at this point that I am actually allowed to contribute, by helping with the labelling and checking that all the names are correct (you can loose points by leaving out a full stop, even). At which point we retreat to hit the bright lights of London. Except that we are exhausted. So its back to our b&b to off load our baggage and a change of clothes, before finding something to eat. Vauxhall, never used to feature on our radar, that is until The Garden Museum booked us into a b&b there, when I was delivering a talk at the museum. Its great, all in walking distance from The RHS halls apart from many other places, easy bus and tube access. The b&b is something else, a gem of a find, really friendly guys running it immaculately kept, everything imaginable supplied including free WiFi (why oh why are British hotels so tight to charge for this, when the rest of the world consider it to be part of the esential service provided, its so mean minded). Then there are the breakfasts, all you can manage and more, from a wide choice. All done in the very friendliest of ways. It was them, on asking for a recommendation for a restaurant, that walked us to Pico Bar & Grill, introducing us to the maitre d’. Our Friend Finlay Colley introduced us to the Portuguese cuisine when we stayed with him at his bolt-hole in the Azores. Pico is a Maderan restaurant, family run in a quaint old fashioned style, while the prices are something from the past as well. Full of atmosphere not least from the overhead trains (its in the arches under the line) and Portuguese families taking advantage of the reasonable prices. Where else could you get a quail as a tapa for £6.00 (I’m a sucker for fowl) or scallops with chorizo for £4 something. We can recommend the house red wine as well. On to the show, the doors opened at 10am and it was soon full on. The three of us were practically overwhelmed for hours, selling out of what we had considered to be a good stock of Illicium simonsii and Pachysandra axillaris 'Crûg's Cover' within a few hours. Admittedly they were both stunning in our display, with the Pachysandra reeling people in with its intoxicating scent. How many people commented ‘’Is that really a Pachysandra? Never thought I’d want to buy one of them.’’ Gratifying to educate the gardener. Same went for the Illicium, flowering naturally in February, for a long time, scented, hardy all of that even as a young plant. Other plants that drew the most comments were (in order of popularity) One of our finds from Guatemala, Piper heydei, an immediate success with stunning large rugose rounded foliage, despite being in the middle of winter and looking its worse. Rhodoleia championii towering above most other plants was appreciated for its stunning red young stems contrasting with the white undersides of the evergreen polished foliage, can’t wait for the flowers to appear on this they should resemble red to bright pink Rhododendron flowers, which is quite amazing for a member of the Hamamelis family. Daphniphyllum aff. 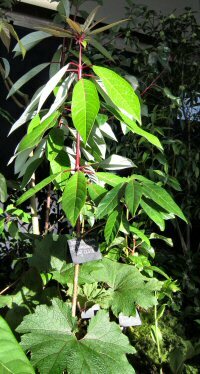 himalense with deeper red stems and petioles also had foliage with white undersides, but larger pointed leaves with deeply impressed venation from above. Both these evergreens shone out like beacons in the shafts of sunlight that caught them through the glass roof, nobody could fail not to be impressed. 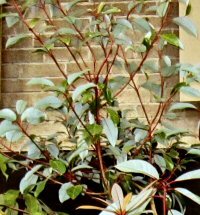 The Daphniphyllum incidentally has only been identified to having an affinity to D. himalense, a species which is not yet in cultivation, despite my yearnings and endeavours. There are so many species out there judging by those we have come across, that have not been described to science yet. World taxonomists have so far shied away from attempting to classify them, due in most cases to the fact that the most identifiable parts of the species are somewhat fleeting and tend to drop off, shrivelling up in herbarium specimens rendering them useless. 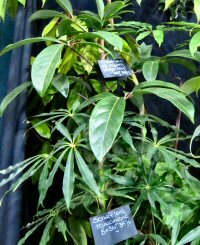 Most of the plants on the display were enquired about many times over, but the last of those that were being constantly asked about was the new Schefflera aff. alpina. This is yet another species that our attempts to identify have failed to come up with a definitive identity, which usually indicates that it is new to science. 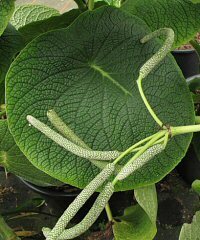 A species that stands out by its leathery leaflets broader and fewer in number that its closest ally S. alpina. Collected from a different environment on exposed open ridges in the high mountains of northern Vietnam, where they rarely achieve a height of two meters, flowering and fruiting at half of that for us, indicating they are already mature at this size. It was during that first busy morning that our medal arrived, where upon I was presented with it in a folded paper while deep in conversation with an admiring (the plants) customer. It took a little time to open the paper to see what was inside and even longer to get Sue’s attention, who was likewise busily attending to customers. On finally attaining her attention by waving the gold medal in her direction, she immediately started to dance with Edward. As you may have realised, we are obviously not blasé about achieving gold being still relatively new to the phenomena. It is so good to catch up with the many friends and acquaintances that we have accumulated over the years, the halls at Vincent Square are definitely the place to do it in. So many I dare not list all the names, many of which belong on the who’s who list of horticulture, attending the many meetings that coincide with the Spring Show. 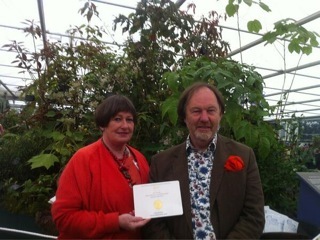 Although I have to mention John Massey of Ashwoods Nurseries, as we dined together that evening celebrating our medal. It was good to find John on such good form, although I suspect the reason he was elated, was due to his upcoming trip to find the last elusive Hepatica which has been hiding in The Himalayas. As is usual the second day of the show was at a more sedate pace. We were soon making ourselves unpopular due to the lack of stock after the sell out of our two most popular lines, but what can you do? Last year we had both plants there and because neither were in flower we had to carry most of them home. All the same some good plants found good homes (we trust), besides that we were delighted to be invited out to supper that evening when a friend from the judiciary who lived just around the corner, called in to see us. Before we knew it someone rang a bell and it was time to start pulling the displays apart once more, at which time Daniel turned up along with a colleague. All this young blood made short work of packing everything away, hence we had collected the van and packed everything into it by 7pm. Giving us plenty of time to re-park the van and find the address for supper. Before our bracing walk back over the bridge to Vauxhall, we spent a pleasant evening catching up particularly with what was happening back in North Wales. A rather jovial way to end our time at the Spring Show, celebrating with friends good food and a couple of bottles. We did it! Much to our surprise our first Chelsea and we bagged all the prizes. 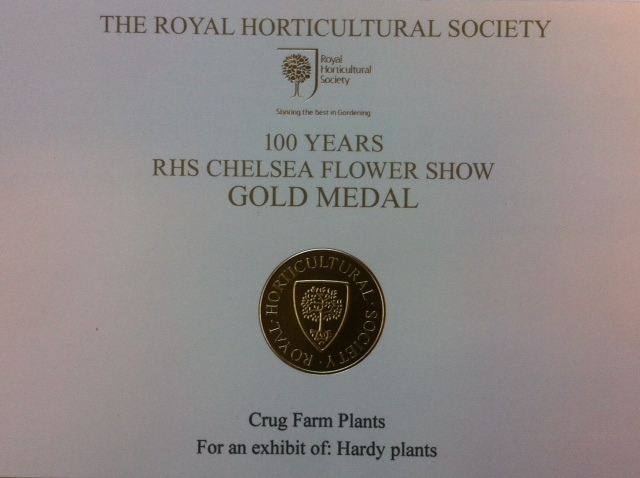 Our first Chelsea Gold Medal topped by The RHS President’s Award what a surprise. The coveted Gold Medal that Sue had set her sights on. Joe on the left youthful muscle man for the build up as well as seeing to all those last minute details. While Tricia (on the right) was there throughout the build up playing a vital role with her calligraphy. She did enjoy chatting to all the visitors. A chance to have a celebratory drink with some friends, you may recognise some. 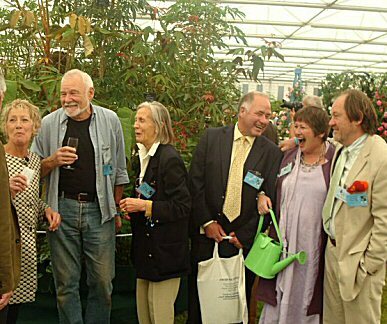 Left to right Carol Klein, Edward Elfes, Veronica Cross, John Massey and us. A visit from another winner, Cleve West who won the Best Show Garden for 2011. Saffron left her two boys for the day to join us and meet up with some of her old neighbours. Home at last after a week-long excursion to London, exhibiting at the Royal Horticultural Society’s RHS London Plant and Design Show. Again it is so inspirational to be encouraged in what we do by the people we meet there, by so many established and potential customers and to finally meet so many of our mailorder customers, who took the trouble to visit the stand. 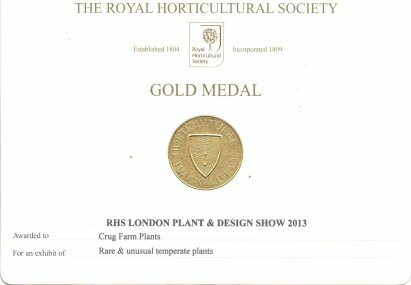 The RHS judges played their part in encouraging us to fight on by awarding us another gold medal. It does take in a full week just to exhibit for two days, luckily this year we were blessed with plenty of help. With Edward Elves coming out of retirement again (trained by Constance Spry herself no-less, even worked on the Queens coronation) to teach Sue the art of setting up. As well as Ben Kettle bringing in some much appreciated (young) muscle and sharing the driving. Without doubt the star attraction of this year’s exhibit was the flowering Illicium simonsii, which I had originally collected the seed of at high altitude in 2000 on Longzhoushan Sichuan. The pale yellow flowers opening a bit earlier than usual as the plants were protected in a polytunnel, only releasing their perfume on arriving home. Our Aspidistra collections were also very popular soon selling out on the first day, meanwhile our collections of Schefflera drew plenty of admiring comments, although frustrating too many as they were too tall for them to carry home, just an indication of their value. Luckily it was a much easier drive home this year, not having to negotiate our way through snowdrifts, as last year. All the same it was in the small hours by the time were home. What an honour…. 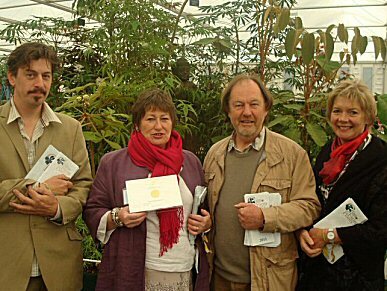 it was Sue really although Bleddyn was dragged in, as Crûg Farm Plants were presented the RHS Award by Elizabeth Banks the RHS President, for the best exhibitor new to the London Flower Shows 2010. It is worth noting that there were no less than three winners this year from North Wales. Namely Medwyns of Anglesey awarded the Gordon Lennox Trophy and Dibleys Nurseries of Ruthin awarded the Anthony Huxley Trophy, all far more experienced than ourselves. We are delighted to have been invited to return to Lucca again this year. Bleddyn has decided to join me having heard so much about the wonderful Italian hospitality. He will be giving an illustrated talk about our plant collecting. He is not an Italian speaker but I am sure that the pictures will make up for the lack of Italian. We will be happy to take plant orders to Italy. Orders must be with us by Monday 23rd August.